デルタ 《ギリシャ語アルファベットの第 4 字 Δ, δ; 英字の D，d に当たる; ⇒Greek alphabet 表》. 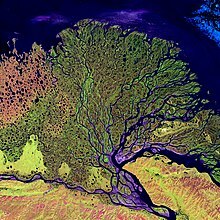 Lena River delta (landform at the mouth of a river). From Ancient Greek δέλτα (délta). The fourth letter of the modern Greek alphabet Δ, δ. A landform at the mouth of a river where it empties into a body of water. The letter D in the ICAO spelling alphabet, which assigns words to letters of the alphabet. (computing, informal) A small but noticeable effect. Compare epsilon. This will slow the main code path down, but only by delta. (computing) The set of differences between two versions of a file. When you update the file, the system will only save the deltas. (surveying) The angle subtended at the center of a circular arc. A type of cargo bike that has one wheel in front and two in back. (electrical, often attributive) The closed figure produced by connecting three coils or circuits successively, end for end, especially in a three-phase system. (finance) The rate of change in an option value with respect to the underlying asset's price. (chemistry) A value in delta notation indicating the relative abundances of isotopes.